This audio amplifier showed in this circuit diagram , is a very simple and efficiency audio amplifier circuit based on the TDA1308 integrated class-AB stereo headphone . The device is fabricated in a 1 mm Complementary Metal Oxide Semiconductor (CMOS) process and has been primarily developed for portable digital audio applications. You can use this circuit diagram with TDA1308 or TDA1308A , the difference between the TDA1308 and the TDA1308A is that the TDA1308A can be used at low supply voltages. 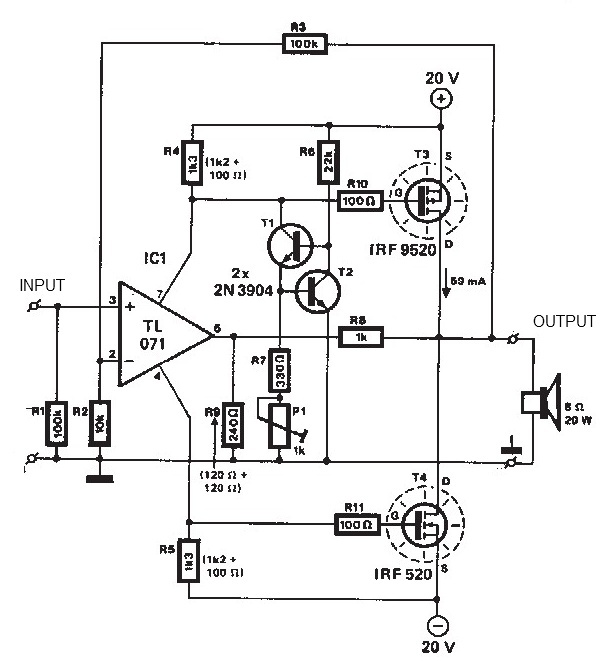 The maximum output power that can be obtained with this circuit is around 80mwatts. This audio amplifier circuit requires a very low voltage power supply : from 3 to 7 volts for single supply or 1.5 to 3 volts for dual supply , for TDA1308 . The TDA1308A supports a low voltage input down to 1.2 volts , but the typical power supply required for both circuits is 5 volts for single supply and 2.5 volts for dual supply . As you can see the circuit requires very few external components and can be configured to work in stereo or mono configuration.